Happy New Year everyone! This is my first new recipe for the year 2011, and a super simple one! During the holidays I brought my little girl to a neighborhood Japanese restaurant, she ordered Teriyaki Chicken and couldn’t get over how delicious the sauce was, so this is my attempt at recreating the dish. 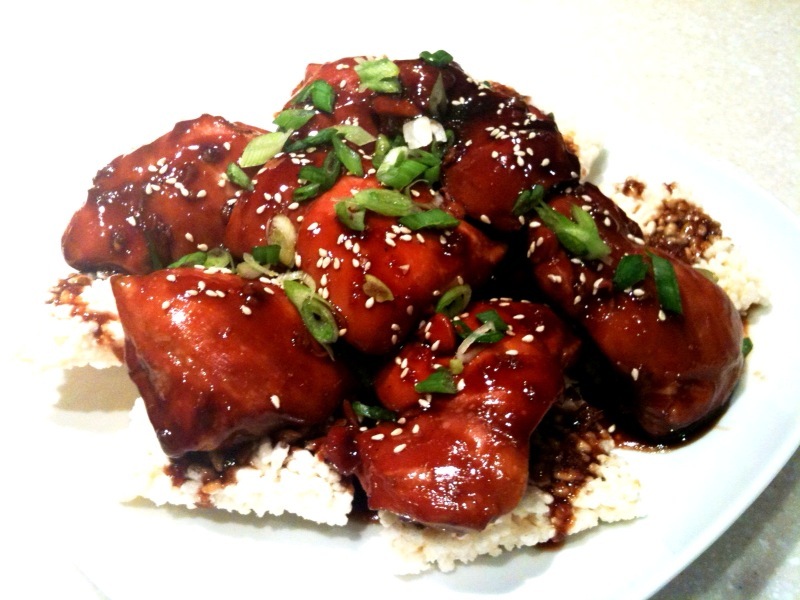 I know the photo looks identical to the Korean chicken thigh recipe I cooked last year, but they do taste different, and this one has sesames on it, so no I didn’t reuse the photo. Haha! Cover a baking dish with aluminum foil, place chicken pieces in. Brush chicken with the sauce. Turn pieces over, and brush again. Bake in the preheated oven for 30 minutes. Turn pieces over, turn down the heat to 375 degrees and bake for another 30 minutes, until no longer pink and juices run clear. Brush with sauce every 10 minutes during cooking.